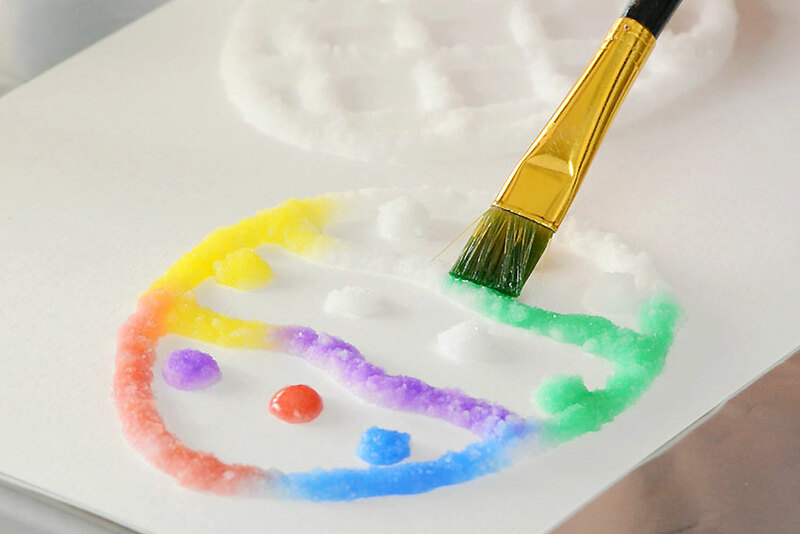 Have you ever tried salt painting?!? With a little bit of white glue and regular kitchen salt you can make some really awesome shapes! It’s like puffy paint except it has a really cool bumpy texture from the salt! 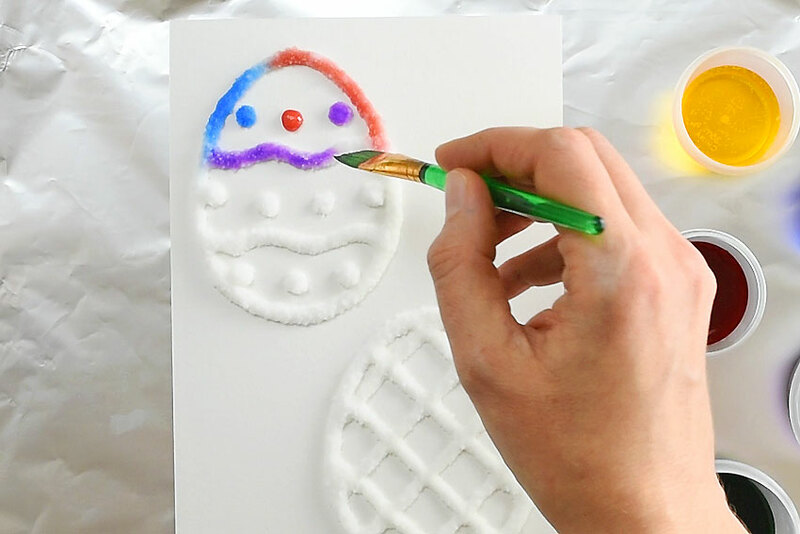 These salt painted Easter eggs are such a fun and festive little craft for Easter! 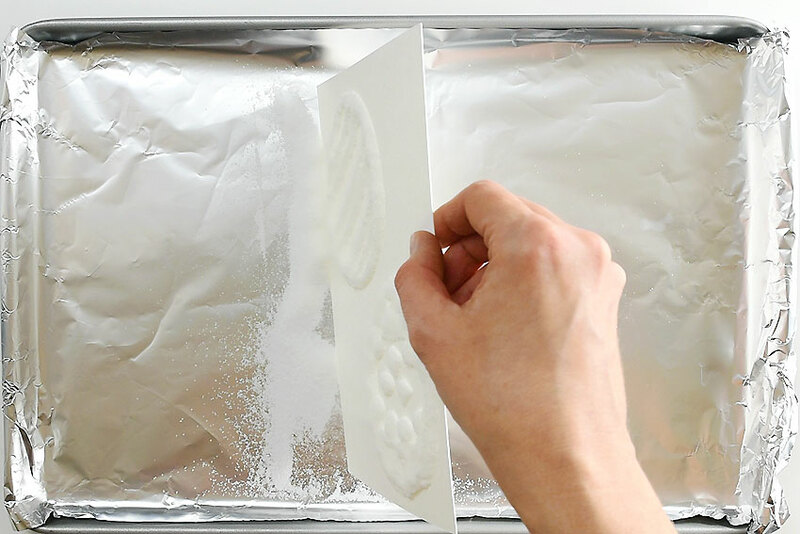 You can paint them when the glue is wet or dry – either way will work! You can colour them however you like and once they’re dry, you have an awesome craft to hang on the fridge! 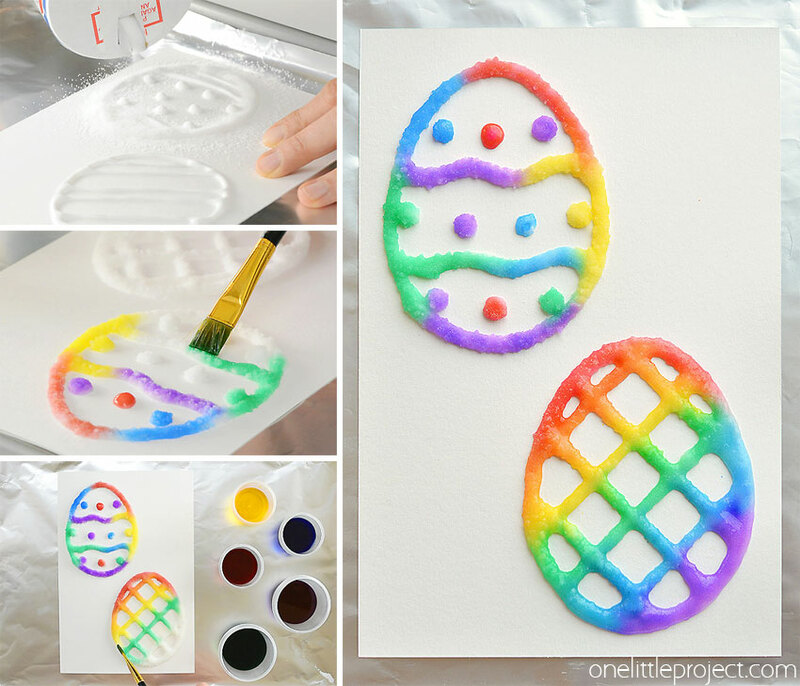 Or you can cut out the egg shapes and make a little Easter basket. 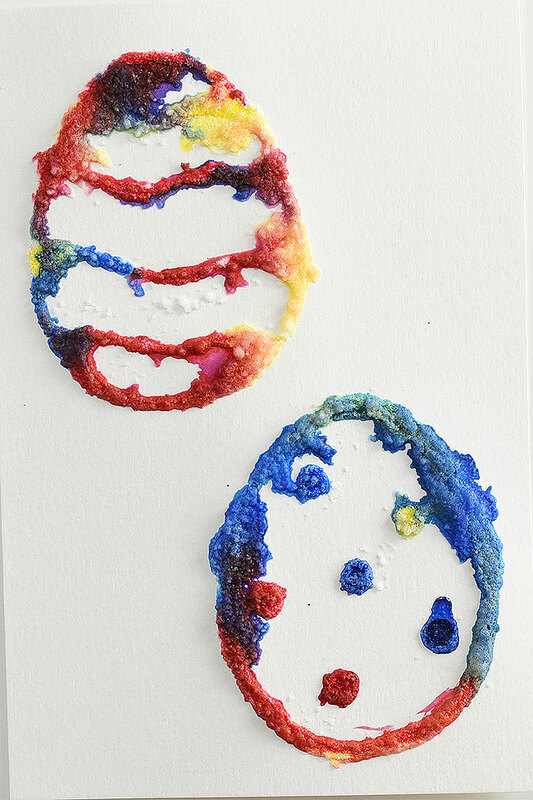 Or you could even make Easter cards with salt painted Easter eggs on the front! So far the salt and the glue on ours seems to be attached really well, even when I tap the paper and rub it gently. I think they’d make super cute Easter cards with “Happy Easter” on them?! 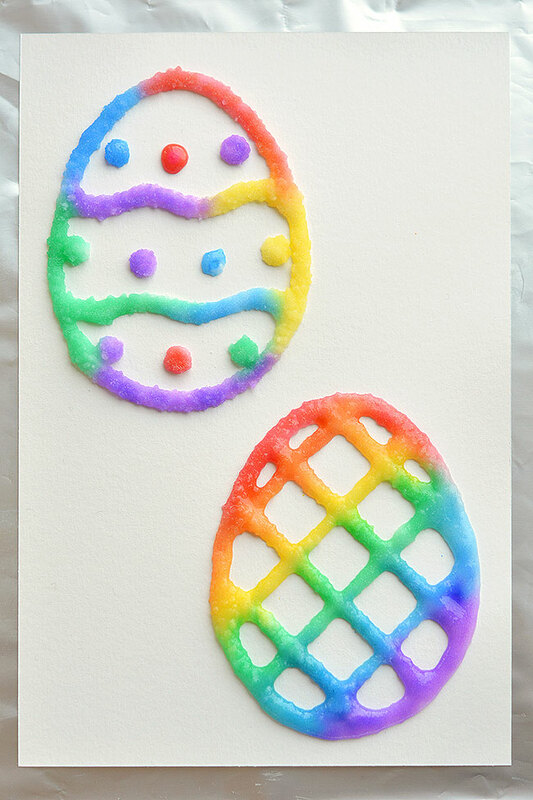 Ooooo… Or you could write “Have an EGGScellent Easter” on your cards! I’ve included my free printable for the egg shapes below, but you can “draw” pretty much whatever shape you want with the glue! I think my favourite part about salt painting is dabbing the paint onto the salt and watching the colours run. A little paint goes a long way (literally!) so it’s really fun to watch! It’s pretty hard to capture that in photos so you can check it out in the video below. 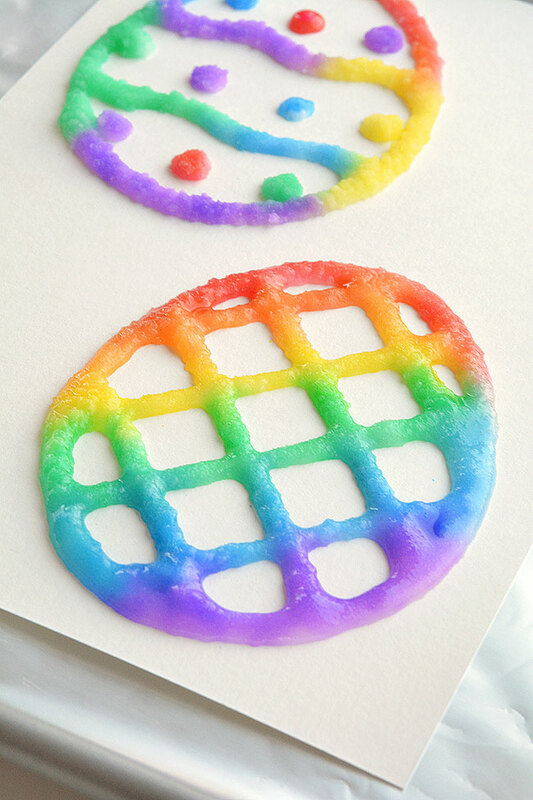 I used watercolor paper when I made this craft, but you can use any type of thick paper. Thin paper gets too wet from all the glue, and the eggs don’t turn out as well since the salt sticks where it’s not supposed to. 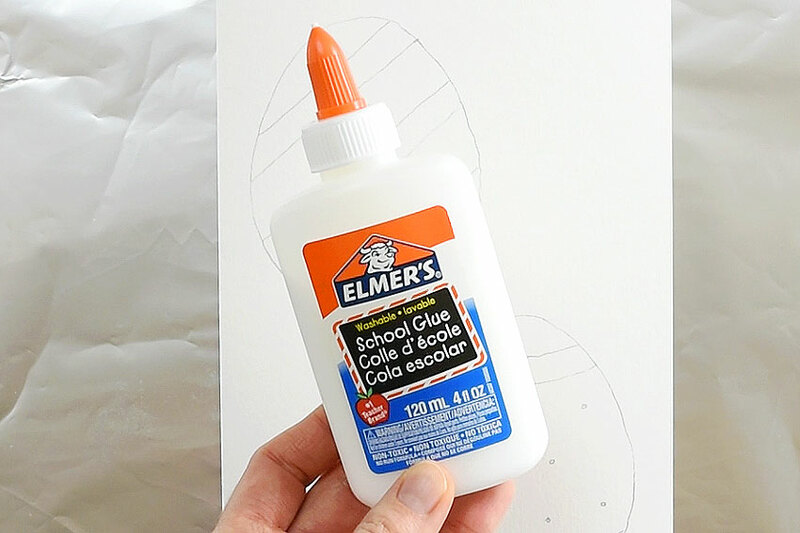 I HIGHLY recommend using Elmer’s white glue (or another high quality brand). 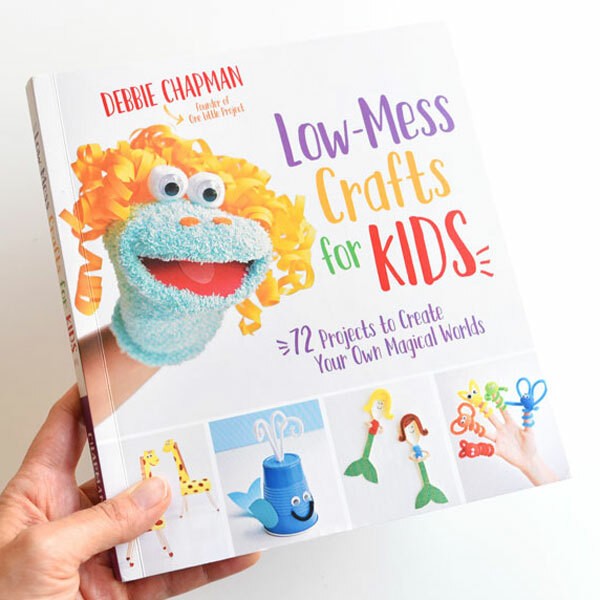 I originally tried this craft using generic dollar store white glue and it didn’t work. My dollar store glue was too watery and when I added the salt on top, the glue spread and made it look very messy. You can check out a photo of the unsuccessful salt painted Easter eggs we made with dollar store glue here. I also used undiluted watercolors in that one, which is why the colors are so dark. When you’re tracing shapes onto thick paper that you can’t normally see through, use a window during the day to help you out. First place the template on the window, then place the thick paper on top. You can use tape to hold everything in place if you like. The light shines through both papers and you can easily trace your shapes onto the thick paper! You can print out our free printable Easter egg template below. I used 9″x 12″ watercolor paper (the exact link is in the list above), and cut each sheet in half so they were 6″ wide by 9″ tall. 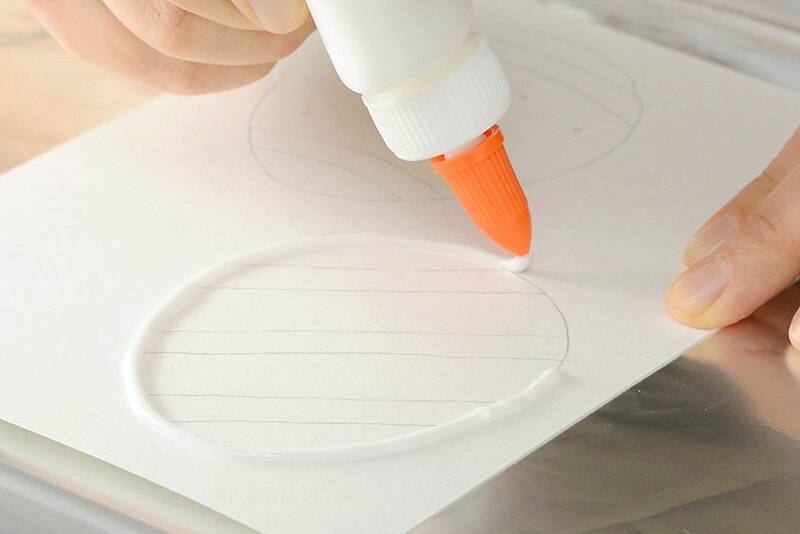 Once you have your shapes drawn on the thick paper, trace over all of the lines with white glue. I used dollar store table salt that I bought for one of our salt dough projects. It’s just regular old kitchen salt that you’d use for cooking. There’s no need to wait for anything to dry. 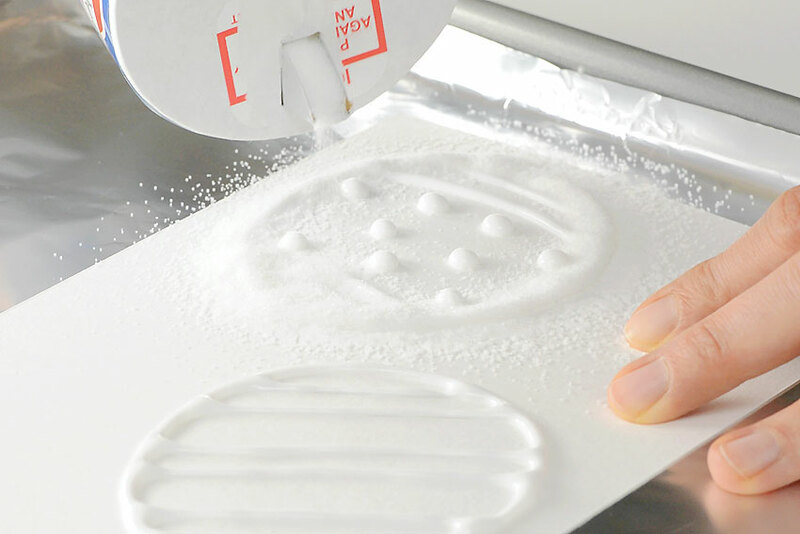 As soon as you add the salt you can carefully lift the sheet of paper and pour off the extra salt. Turn the sheet upside down and give it a very gentle jiggle to get the extra salt off. Don’t tap the back of the paper to get the salt off. I tried it and way too much glue and salt came off and my shape wasn’t nearly as puffy afterwards! 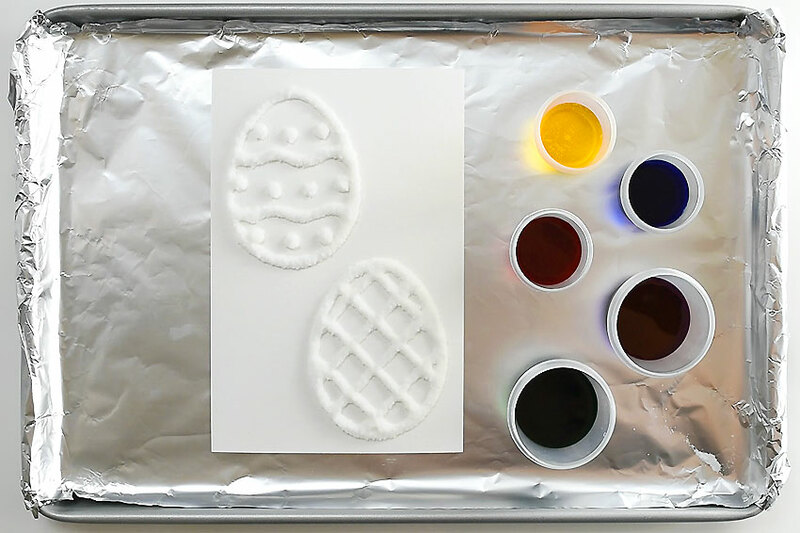 Next, you’ll want to set up your liquid watercolor paint. I used 5 parts water for 1 part watercolor paint (the exact watercolor paint I used is in the list above). When the salt painted Easter eggs dry, the colours do lighten up considerably. But since these eggs are for Easter and I wanted pastel colours, so it worked out perfectly! If you use undiluted watercolor paint the colours are VERY strong and vibrant. So it really depends what you’re going for. Remember, all brands of watercolor paint are slightly different, so if you’re using different paint from what I used, you might have to experiment with how much water to add to figure out what looks best. Dip a paintbrush into the liquid watercolour paint, then gently dab the brush onto the salt and glue. Just a very gentle dab, just barely touching the brush to the salt and glue. You can paint your eggs however you like! Experiment with what happens when you put different colours next to each other. The colour mixing is really fun to watch! Keep in mind that the photos here show our salt painted Easter eggs when they were still wet, so the colours are still very vibrant. With the watered down liquid watercolor paint, the colours became a nice soft pastel colour when they dried. (Not shown). When you’re done painting your eggs, you can leave them to dry. The salt and glue stays puffy, even after they dry! It takes about a day or two for the glue to completely dry. 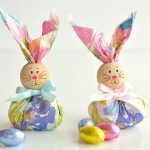 These salt painted Easter eggs are such a fun and easy craft idea for spring time! 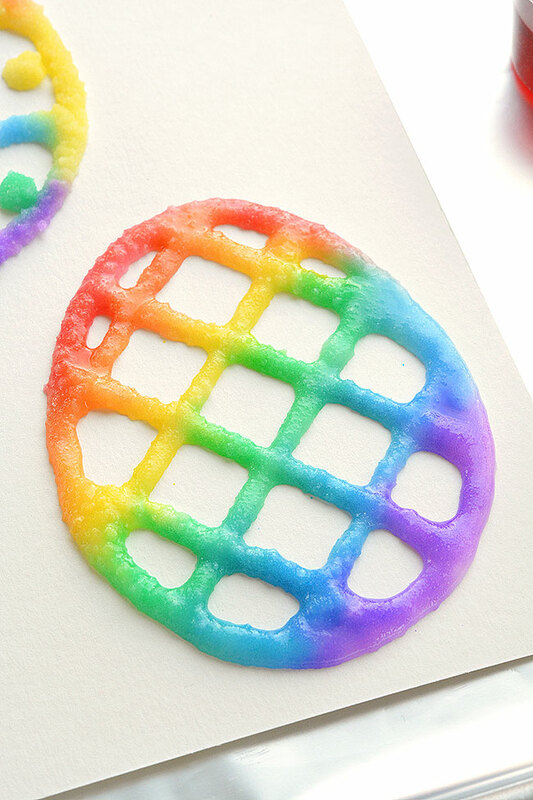 With a little bit of salt and glue you end up with colorful puffy paint like shapes with an awesome texture! They even stay puffy after they dry. 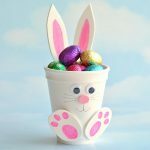 Cut out the eggs to make an Easter basket craft, or you can make cute DIY Easter cards! 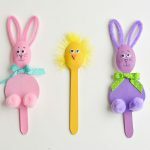 This is such a great Easter craft for kids! 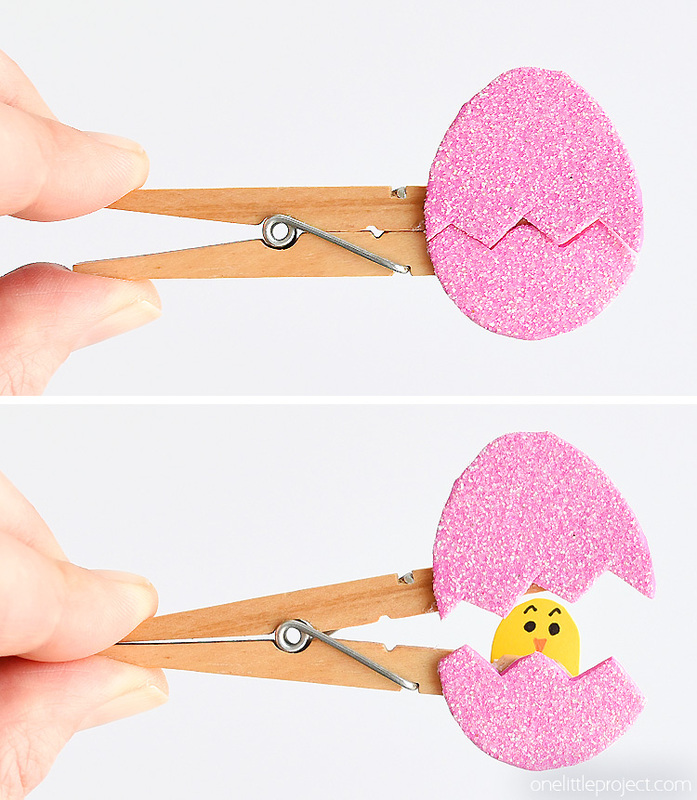 If you’re looking for more egg themed Easter crafts, check out our peekaboo clothespin eggs. 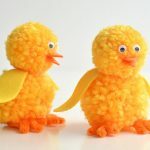 With a cute little hidden chick inside, these always make the kids (and me…) smile! Or you can try our paper roll bunnies. 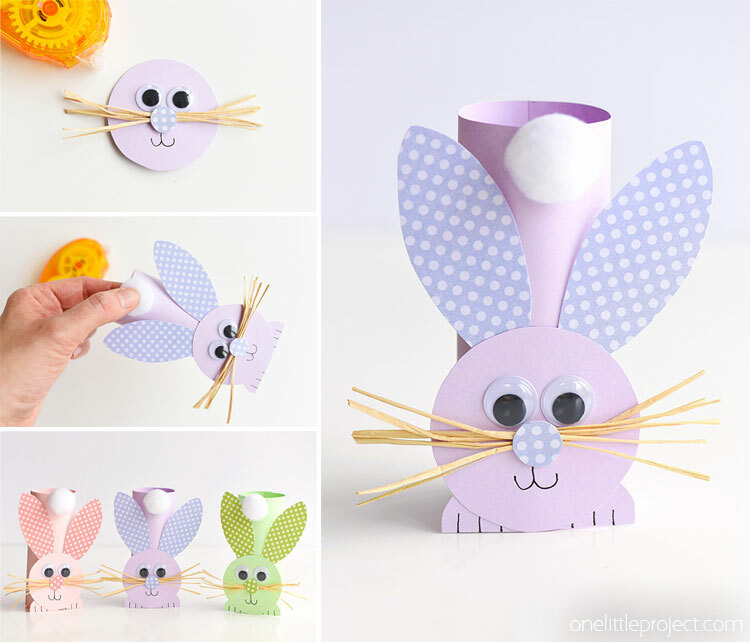 This little craft was #1 on Pinterest for weeks last year when you searched “Easter”. So simple and adorable!